A Chinese of Rank, from Thomas and William Daniell's A Picturesque Voyage to India by the Way of China, published in 1810 by Longman, Hurst, Rees and Orme, London. The size of the print is 7.5 inches x 5 inches. Reverse side of the jug. 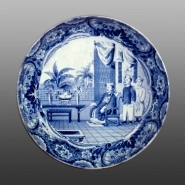 An additional example of the A Chinese of Rank pattern is shown here on a round earthenware unmarked saucer printed in blue underglaze. Attribution of this example to Spode is made based on several copper engravings of this pattern retained in the Spode archives and an egg stand marked SPODE that is known. The pattern was also made by Miles Mason. 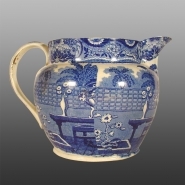 Earthenware jug very similar in shape to the low Dutch jugs produced by Spode, but this example lacks the thumbrest of the Spode shape. The commonly used pattern name is A Chinese of Rank, after the source print by the same name. The pattern is the same as that on other pieces attributed to Spode, although only an egg stand in this pattern is marked.